With this blog, we would like to invite all interested readers of our website to catch a glimpse of our work within the project. We will be reporting about our current, scientific ongoings and will inform you about important dates and events. An obituary – Who can find Eddy One? s via satellite transmission. Eddy was the “blogger” amongst the drifters and documented parts of their journey together. From minute one onwards, we tracked his path. Initially, it seemed as though he was aiming straight for the East Frisian Islands. Just before reaching Juist, he appeared to be stuck. It took him several tidal cycles until he continued his trip. 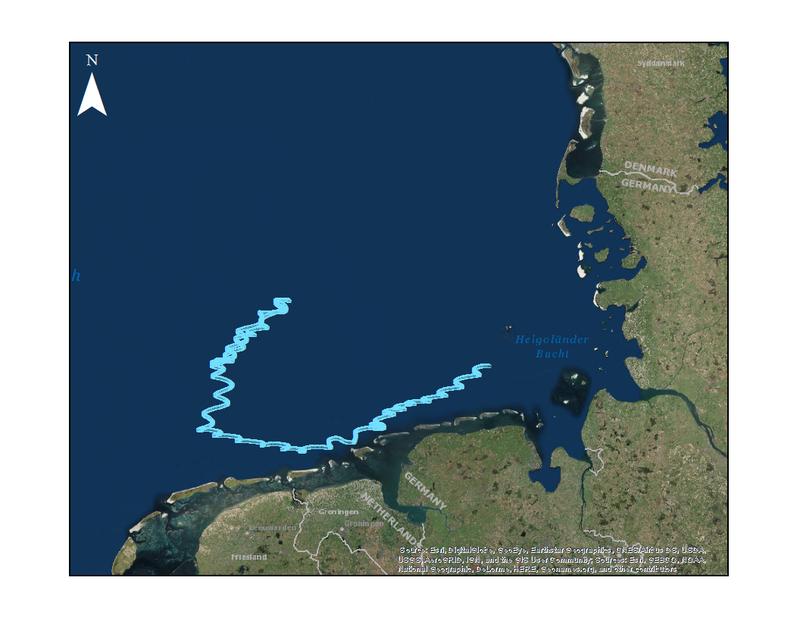 The persistent easterly winds that prevailed since his release into the water were the main reason for Eddy’s initial route. We expected him to catch the tide and drift in south-westerly direction. Thus the coast of England appeared to be his destination. However, Eddy changed his mind and followed the call of the North. The easterly winds turned into southerlies that made Eddy change his course and let him drift back into the open North Sea. For two weeks and four days, we were able to track Eddy’s journey. Then we lost the connection. On October 23 at 06:47 (GMT+1) he stopped sending us his position. However, he had announced his impending radio silence 12 hours beforehand. With a message, he let us know that his power was running low. “Please find Eddy!” is now our mission. He left us with some insight but also with a hole in our researcher hearts. Whoever finds him: We look forward to having Eddy back with us again. Eddy was developed and tested by our working group Marine Sensor Systems. This first trial was a complete success. With great certainty, the loss of contact was caused by drained batteries. Eddy’s casing and his components appear to have been reliable and our colleagues did a great job. To date, there are unfortunately no significant reports of the other 800 wooden drifters with whom Eddy started his journey. Therefore, we are curious as to when and where Eddy One will return from his adventure so that we may send him on yet another journey. 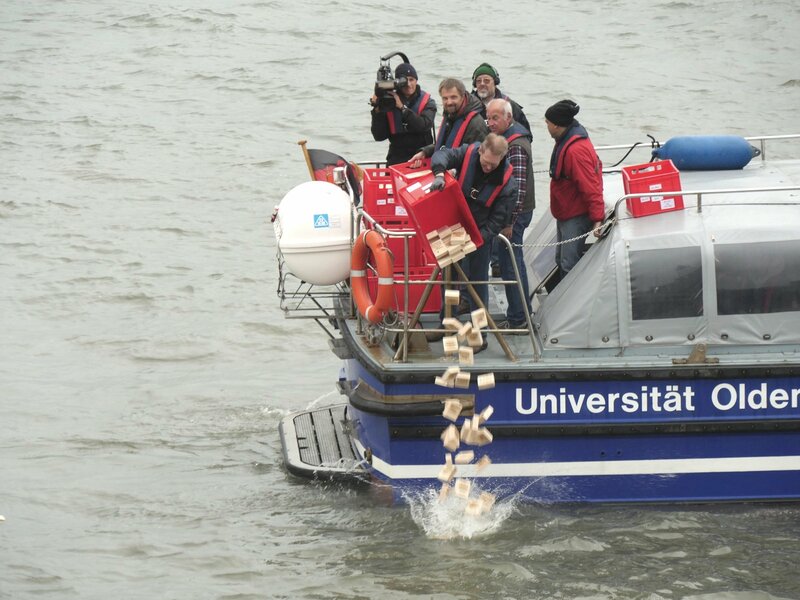 Recently, we received the information from several people, who had diligently reported drifters, that a whole bunch of our wooden blocks had been washed ashore behind the last jetty just before the naval base, here in Wilhelmshaven. Hence, I made my way to the described location to check out the situation. Could it be the wooden blocks from our drifter release just there the other week? Or had some of the drifters from our release near Heligoland made it back to the mainland? Would I find only our drifters or also marine debris? In a race against the rising tide, I searched the 56 m long stretch of sand for an hour. The result: About 200 of the 800 drifters from our release last week had more or less made their way straight back ashore, driven by the tides and the prevailing easterly winds. Lots were buried amongst masses of seaweed that had also been deposited on the sand and rocks. However, the amount of litter that I came across was almost as abundant as the number of drifters: 119 items, 94 % of which were plastic. Most of them were characteristic of the locations: lots of candy wrappers, packaging from snack bars, bottle caps and cigarette butts – due to the lack of signs of weathering, most likely lost by strollers, blown out onto the water or directly onto the strip of sand behind the jetty. Scraps of five different balloons including two strings demonstrate that the release of helium-filled balloons should not be underestimated as a source of marine litter. What goes up, must come down. In this case, it is pieces of balloons that often get released by the dozen or by the hundreds during city festivals or birthday parties. People easily forget that those balloons will eventually burst. When this happens over the oceans, animals mistake the balloon scraps that fall into the water for prey items and swallow them or become entangled in the attached strings. Typical for marine-sourced plastic litter were the total of 31 strings and one knot of so-called “dolly ropes” – often orange or blue bundles of plastic threads which get attached to the underside of fishing nets to protect them from abrasion on the seabed (for a short description: http://www.dollyropefree.com/the_use_of_dolly_rope_by_fishermen). Drifter reports. 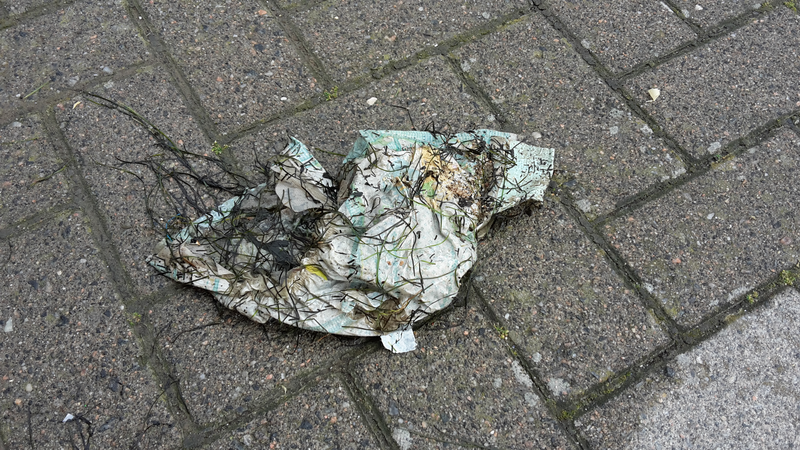 In between the drifters that were washed ashore in Wilhelmshaven, lots of litter could be found. Plastic was the predominant litter type. 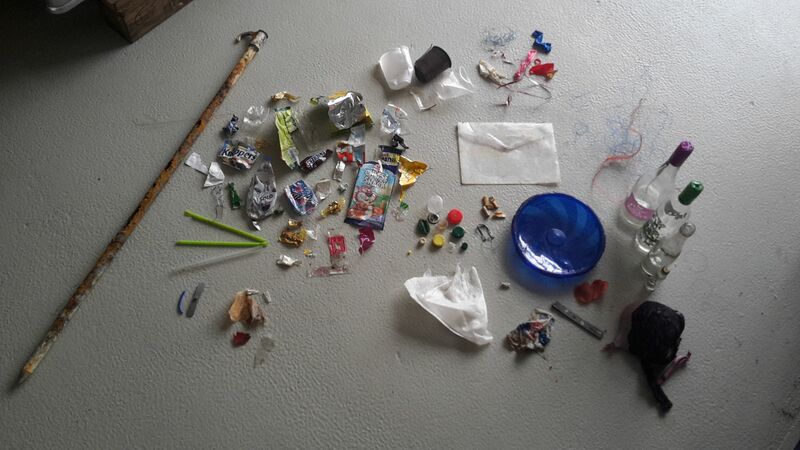 These findings were a first confirmation that our wooden drifters successfully simulate drifting macroplastic litter. To date (25.10.2016 09:40 GMT+1), 1077 reports of found drifters have reached us. Two more drifter releases will take place during the next couple of days in Cuxhaven as well as on Langeoog. As part of our work, we will visit other places with high numbers of reported drifters in order to analyse any litter that has been washed ashore at those locations. By doing so, we aim to find potential correlations between the beached litter and polluters at the drifter release points. They are afloat! 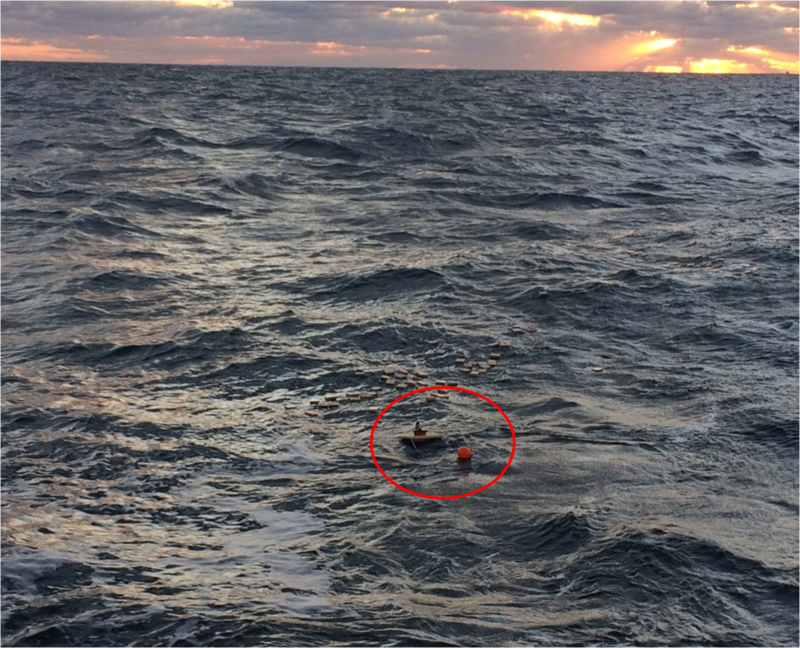 On October 5, during an almost picture-perfect sunset, our first 800 wooden drifters and GPS-buoy Eddy were release into the North Sea on one of the busy shipping lanes south-west of Heligoland. Last week, two more releases followed: one from our institute’s boat, the Otzum, near the jetty just before the naval base in Wilhelmshaven; and the other, on dry land, from the Ems barrage in Gandersum. First drifter release. 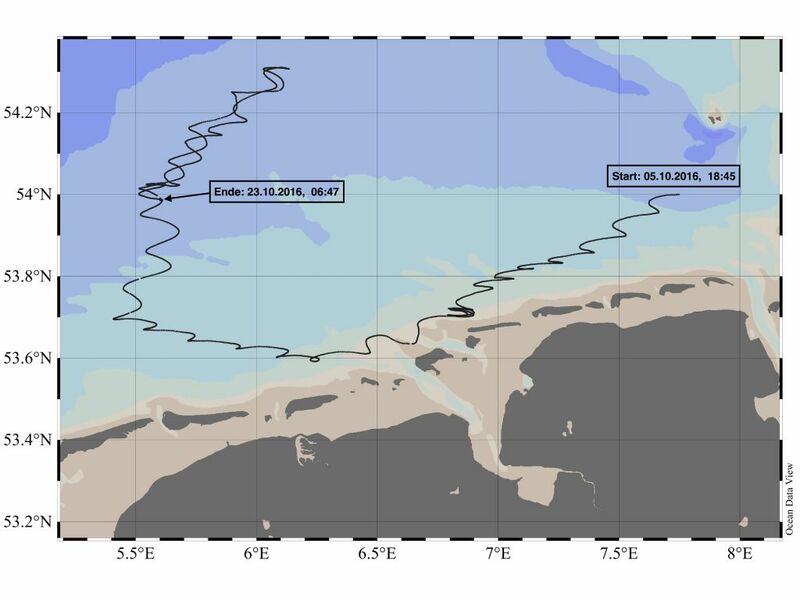 GPS-drifter Eddy and our first batch of 800 wooden drifters are released from the FS Heincke, south-west of Heligoland. Second drifter release. In the presence of a fairly numerous audience, the second batch of 800 drifters gets thrown overboard. On both occasions, the weather gods did not look favourably upon us: a cold, easterly wind, overcast skies and the one or odd rain shower. Nonetheless, a fairly large audience of members of the press, students, the drifter-producing team from the GPS workshop and colleagues from the project team as well as barrage staff witnessed the spectacle with great interest and excitement. Lots of photos, video recordings and interviews were the result! And while the last couple of questions were answered, our wooden “message in a bottle” drifted out to sea. Third drifter release. From the Ems barrage we sent further drifters on their journey. Beside the almost overwhelmingly positive media and e-mail feedback, we have also received our first drifter reports! Many thanks already! For this and next week, three more releases have been scheduled: in Norddeich, Cuxhaven and on Langeoog. We are curious and excited to see, how far our drifters will float. 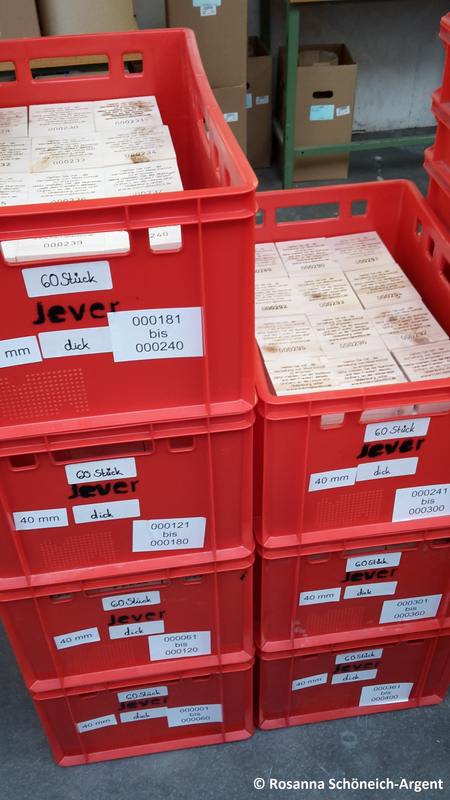 Last week, we finally got to visit the production site of our wooden drifters: the workshop of the Charitable Organisation for Parity and Social Work (Gemeinnützigen Gesellschaft für Paritätische Sozialarbeit mbH Wilhelmshaven, GPS) in Jever. 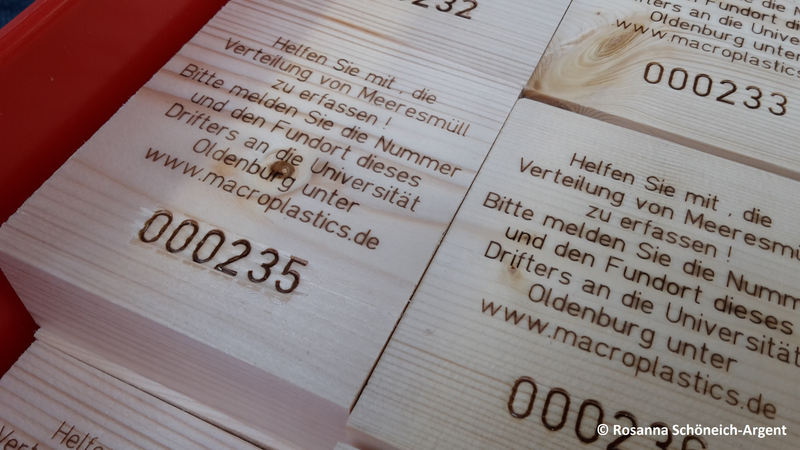 Since the end of June, we have been in regular contact with the workshop managers Mr. Hohn and Mr. Steinbach regarding the organisation and realisation of the drifter production – lots of planning in order to finally receive our first batch of wooden, branded drifters. Mid-September, the wood had been cut, the branding irons had been delivered and installed, and the production could begin. Of course we didn’t want to miss out, so we made our way to Jever. Once we arrived, we were shown the neat little production line. 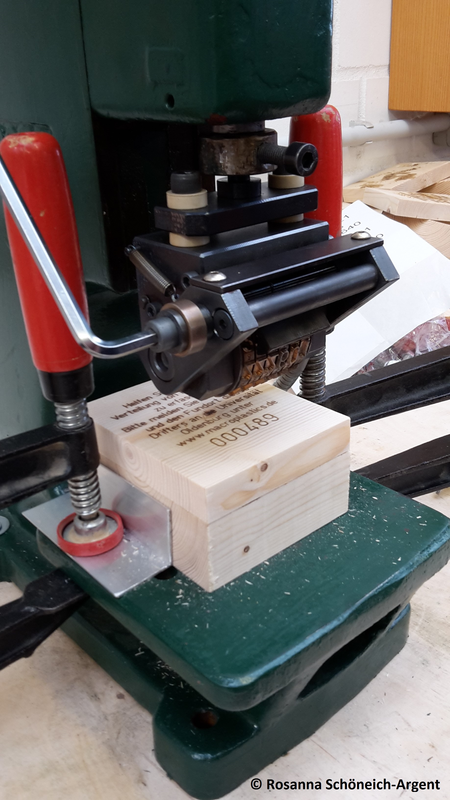 At the first two stations, the blocks get branded with the German and English texts which get imprinted into the planed wood with over 300 °C and a fair bit of pressure. At the third and last station, each drifter gets its individual number. This allows us to track every reported drifter back to its release location and date. In order for us to release them into the rivers and the North Sea, the fully branded drifters are neatly packaged in bright red delivery boxes. Branding the drifters. The wooden blocks get their message and individual number imprinted on them. Freshly branded. The first batch of drifters is ready. Should a branded text be illegible or should a wooden block be inadequate, e.g. cracked, these pieces are sorted out and used as fire wood. That way, every wooden drifter is checked. 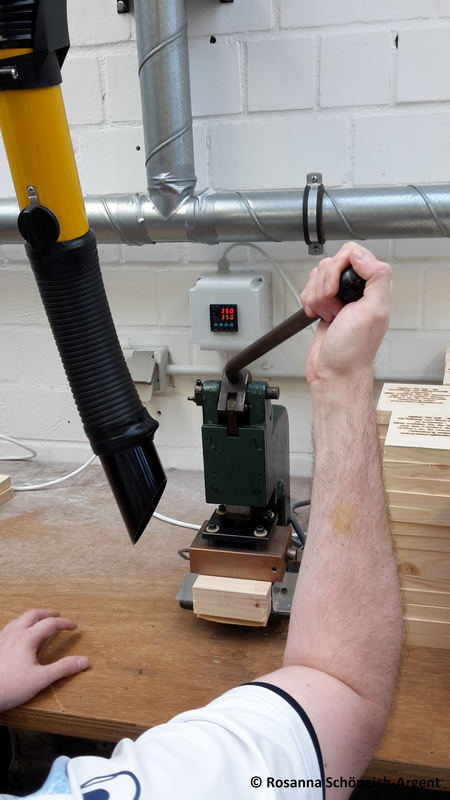 Despite the short time that the drifter production has been ongoing, the workshop team has already developed an amazing working routine, so the production speed is pretty quick. However, for the camera, they make an exception and show us each step slowly and with detailed explanation. Our experiments can begin. Well packaged, the first 800 drifters are sent on their journey aboard the FS Heincke. At the end of the day, we were able to take the first batch of drifters with us. Whilst loading them into the car, we were certain: great team, great work and really great drifters! Currently, these first 800 drifters are making their way on board the FS Heincke towards our first release point: the crossing of shipping lanes near Heligoland. We are curious to see where they will end up and when we will receive our first drifter reports. Honestly, despite what the calendar was telling us, there was not much of a summer feeling going on on August 3. Nonetheless, this time of the year was the reason for a visit from our Lower Saxony Minister of Science, Gabriele Heinen-Kljajić. One destination along the route of her summer trip was the Terramare institute in Wilhelmshaven. 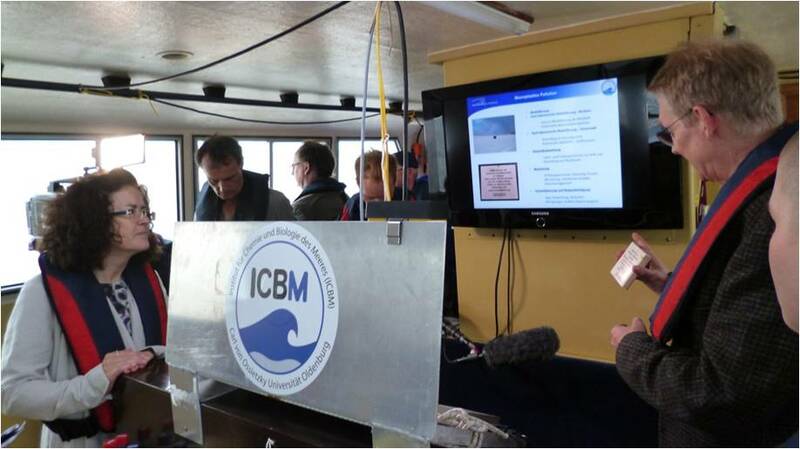 During traditionally sh***y North German weather, a slight drizzle and windy 20 °C, the minister and several researchers departed the Südstrand of Wilhelmshaven and headed out onto the Jade on board the Otzum, one of the ICBM research vessels fit for conditions found in the Wadden Sea. After putting on life vests and being given a safety briefing below deck, the crew aboard the Otzum was ready for departure. Part of the group of people were scientists from our macroplastics research project which Gabriele Heinen-Kljajić was particularly interested in. After all, it is the ministry’s funding that enabled this project to go ahead. Needless to say, we wanted to bring those theoretical research questions to life with practical examples. The mission of our researchers on board the rocking vessel was: to provide a good insight into a scientist’s daily routine. “What I only know in theory so far, I really want to experience hands-on“, Gabriele Heinen-Kljajić emphasised. No sooner said than done! Equipped with a bag full of plastic litter and a prototype of our wooden drifters, project leader Jörg-Olaf Wolff illustrated his explanations regarding our research plans. Scientific enthusiasm. Minister Gabriele Heinen-Kljajić intently listens while our project is explained to her. Prof. Jörg-Olaf Wolff explains the individual research aims to the Minister. Holding the first drifter prototype. “Should I find one of these, I’ll let you know“, Minister Gabriele Heinen-Kljajić assures us. One part of the project is the release of so-called drifters made of wood. We also plan to brand them with a text giving further information about the project. 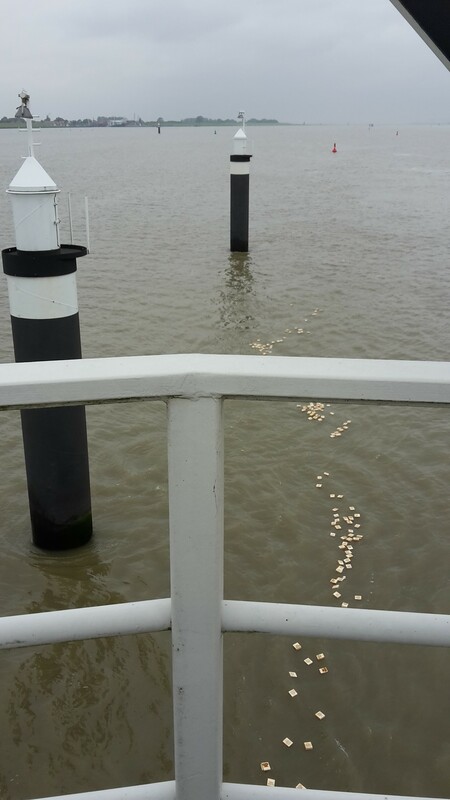 These drifters will then be released along the North Sea coastline and the major tributaries Ems, Weser and Elbe. In October, 800 drifters will initially be released. Everybody who finds such a drifter on the beach, may report their finding to us. By doing so, we can reconstruct the routes of the drifters and can relate that to the pathways that plastic litter may take in the ocean. “With simple means and the help of everyone, this can make an important contribution to research”, says Heinen-Kljajić. Questions for the minister. Despite choppy seas and a stiff breeze, the Minister was up to the challenge of giving interviews for the press. Before we knew it, the Otzum was moored up at the quay wall again. The summer visit ended where it had begun: back on dry land and firm ground.